`You’ll want all day to-morrow, I suppose?’ said Scrooge. Now, it is a fact, that there was nothing at all particular about the knocker on the door, except that it was very large. It is also a fact, that Scrooge had seen it, night and morning, during his whole residence in that place; also that Scrooge had as little of what is called fancy about him as any man in the city of London, even including — which is a bold word — the corporation, aldermen, and livery. Let it also be borne in mind that Scrooge had not bestowed one thought on Marley, since his last mention of his seven years’ dead partner that afternoon. And then let any man explain to me, if he can, how it happened that Scrooge, having his key in the lock of the door, saw in the knocker, without its undergoing any intermediate process of change — not a knocker, but Marley’s face. The hair was curiously stirred, as if by breath or hot air; and, though the eyes were wide open, they were perfectly motionless. 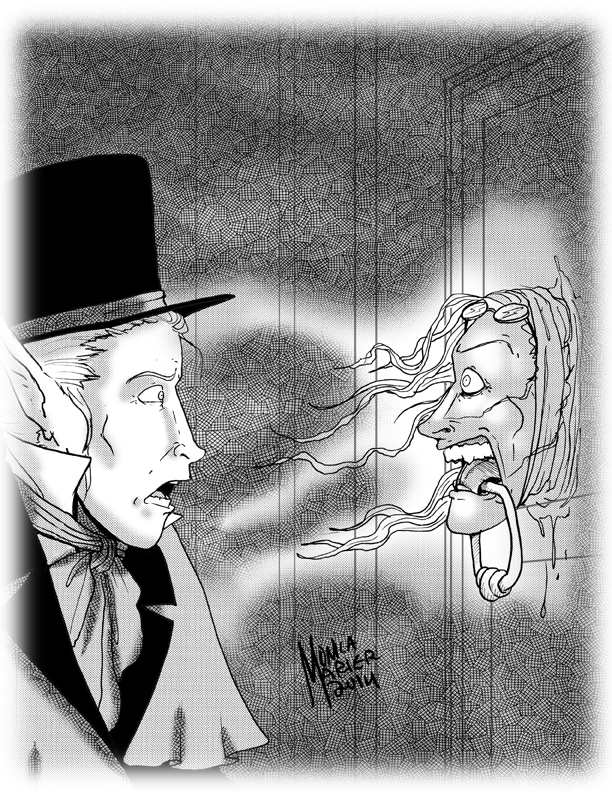 He did pause, with a moment’s irresolution, before he shut the door; and he did look cautiously behind it first, as if he half-expected to be terrified with the sight of Marley’s pigtail sticking out into the hall. But there was nothing on the back of the door, except the screws and nuts that held the knocker on, so he said `Pooh, pooh!’ and closed it with a bang. You may talk vaguely about driving a coach-and-six up a good old flight of stairs, or through a bad young Act of Parliament; but I mean to say you might have got a hearse up that staircase, and taken it broadwise, with the splinter-bar towards the wall and the door towards the balustrades: and done it easy. There was plenty of width for that, and room to spare; which is perhaps the reason why Scrooge thought he saw a locomotive hearse going on before him in the gloom. Half a dozen gas-lamps out of the street wouldn’t have lighted the entry too well, so you may suppose that it was pretty dark with Scrooge’s dip.